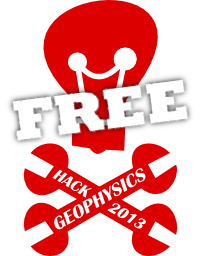 Last month we announced the Geophysics Hackathon. It's one month away today, so I thought I'd post a quick update with the latest developments. First: good news. The event will be completely free to attend. Second, I wanted to clear something up. The hackathon is not about hacking, as in gaining illicit access to other people's computers. That would be bad. Today, 'hacking' has reverted to its original MIT meaning, and tends to mean rapid prototyping and tool creation — playing! — with software, with hardware, or with life in general. We'll be camped out at START Houston, a progressive co-working and incubation space in the East Downtown area of Houston. This is exciting because START is plugged right in to the most innovative, fast-moving, energetic people in Houston. Some of them even work in the energy business! You can come to the hackathon and do anything you like — closed or open source, on your own or in a team, web or mobile or desktop or mainframe. But we are holding a contest, for those that are interested. The contest has some rules. But the first rule of the day is, you don't have to enter the contest. If you prefer, just come and learn something new — I will be there to get you started. Stuck for ideas? There are loads on the wiki page. I'm rather excited about the prizes. I don't want to let the cat completely out of the bag, but we have some Nexus 7 tablets to give away, some Raspberry Pi kits, lots of must-read books, and several years' worth of access to MyBalsamiq — a cloud-based user-interface design tool. Huge thanks to Enthought and Balsamiq for helping to make all this awesome happen. As of right now, there are 16 people coming to the two days. Can you help us get to 25? Send this post to someone you know would be into it... and come along yourself. If you know geophysics or seismic interpretation, or you have a good head for business, or you like math and stats, or you know how to code — you'll fit right in. See you there! I'm delighted to announce that OpenGeoSolutions, one of the few companies to rival Enthought in brains per square metre, is joining us as a supporter and sponsor. Welcome, and thank you to them, and again to Enthought. More great news! dGB, the pioneering software company behind OpendTect — our seismic interpretation weapon of choice — is sponsoring the hackathon. Their generous support is greatly appreciated and is going to make this an event to remember. Bring it!